24,000 Hyatt points for $260 (120 packages available) which is ~1.08 cents per point. 30,000 Hyatt points for $330 (54 packages available) which is 1.1 cents per point. 40,000 Hyatt points for $415 (30 packages available) which is ~1.04 cents per point. 72,000 Hyatt points for $775 (25 packages available) which is ~1.07 cents per point. I’m an avid fan of Hyatt hotels and I find they have a great collection of luxurious yet affordable (on points) hotels around the world that match my travel style, especially as a “loyal” Diamond Member. A few weeks ago I stayed at the Grand Hyatt Kauai for 6 nights, solely on points which came to 150,000 Hyatt points total for the trip. A free night costs 25,000 Hyatt points which if purchased via one of the packages would actually end up costing me ~$270 a night. 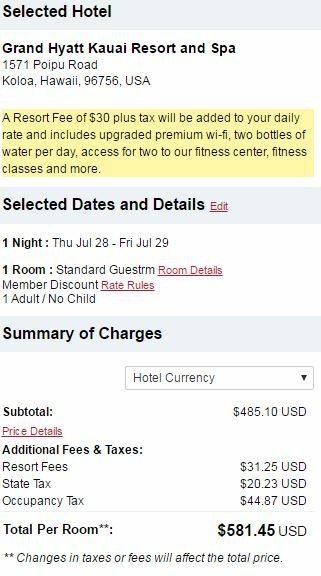 If I compare this to the cash rate for random weekday in July and then add on the tax + resort fee, a typical paid night costs over $580/night! While this trip wouldn’t be free, I’d still be saving over 50% off the paid rate. I could go on and literally find dozens of examples of savings but basically buying points today is a great way to save on future Hyatt stays. I’ll be trying for these Hyatt points at 1pm EST tomorrow…. and probably documenting my failure on Twitter shortly afterwards. Good luck!